A few days ago, I woke to the news that a business school classmate of mine passed away from lymphoma. He was not a friend of mine, though I always liked him. I wish I had known him better. Later that day I got an email from my best friend in business school. He stayed in New York while I moved back to California and we drifted apart. It has been many years since I've seen him and it was nice to hear from him. I often wish I had stayed in New York for a few years after graduation. I don't think that opportunity will present itself again. Last week, I had dinner with a group of my closest college friends. We were all dorm-mates our freshman year and remained close through college and beyond. But since we moved on from college, both literally and figuratively, we don't see each other much, at least not as a group. This was the second time we've gotten together and it was great. But both times we've met, I've left feeling a little sad. Maybe wistful is a better word. I miss the closeness we had, although it comes back quickly. And of course we reminisce. I can't help but think of relationships past, and some that never came to be. Part of this wistfulness has to do with having a chance to get back to myself for a while. We meet without our kids and spouses and it reminds me how different life is now. Being Moe's mom, or maybe just motherhood in general, has changed me and I often feel like I've lost some of myself. Perhaps this is just the normal cycle of life. Perhaps it is growth. I am not unhappy now though my life certainly doesn't look anything like the one I had imagined in my twenties. A child with special needs. A career on hold. Even though I am the same person, sometimes I look back on choices I've made and wonder "what was I thinking?" But the truth is, I made the choices that made sense to me at the time, and that is all anyone can do. 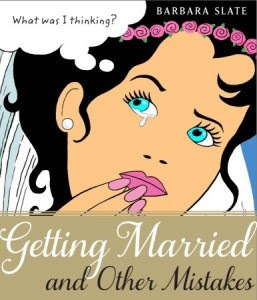 This post is inspired by Getting Married and Other Mistakes by Barbara Slate. This graphic novel offers a raw, yet humorous look at what happens to Jo after a surprise divorce. Join From Left to Write on Thursday, June 28 as we discuss Getting Married and Other Mistakes by Barbara Slate. I received a review copy of the book and all opinions are my own. Aggression Has Returned Just in Time for Summer!